Home/Allergens, Consumer Info, Frequently Asked Questions, Residential Duct Cleaning Articles, Seasonal/Why should I bother purchasing or using the humidifier on my furnace? During the winter the air in your home can be very dry. Dry air contributes to many health issues such as breathing and sinus issues. This is particularly irritating to children. Dry air can damage furniture, plants and even exacerbate skin conditions in your pets! Humidifiers put moisture back into the air. Studies show that humidity in the air reduces the risk of airborne infection! It is better for your skin AND pocketbook as moist air feels warmer than dry air. As wonderful as all this seems, it could be a complete disaster if the humidifier is not properly maintained. Be very diligent in following the manufacturer’s recommendations for proper maintenance. Humidifiers are a perfect breeding ground for mold and mildew. They can be cleaned with a small amount of bleach and water. Overtime limescale and mineral deposits can build up and cause clogs. 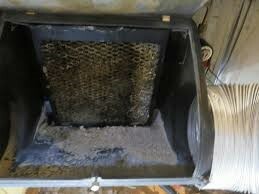 Your unit should be cleaned before and after the heating season. You should always make sure you have a clean humidifier pad in place. A humidifier pad acts as a filter. They should be replaced annually. Once scale, mineral deposits or mold build up, they become impossible to clean. It is also wise to periodically check for leaks. If you find one, shut off the water valve and call in your heating and air conditioning professional. It is very important to find the reason for the leak and have it repaired. As mentioned in past articles, you can get a copy of the manufacturers guidelines on line if you are no longer in possession of the original paperwork.